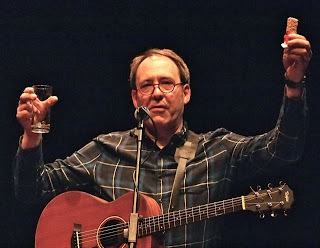 Sometime co-host of The Malt and Barley Revue Angus MacRaild is a professional seeker after rare whiskies. Here's a story about him and others from The Big Issue. Tom Morton's Malt And Barley Revue comes to Elgin. 1 What first inspired you to think of doing a show about whisky? Tom: The Malt And Barley Revue as it now is came out of a show called Tom Morton’s Drinking For Scotland, which was more about the Caledonian relationship with alcohol, the joys and sorrows. I’d written a couple of books about malt whisky and I liked the idea of demystifying the whole connoisseurship thing, the mumbo jumbo. First place I ever combined the tasting with the songs and poems was at Belladrum. 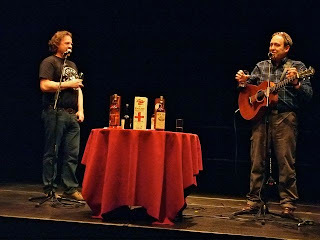 Whisky, music, a few laughs, some tall tales...it seemed to work! 2 Did it take you long to put together the songs/poems/stories that and do you keep adding and taking away or is it a fixed core of material? Tom: Some of those songs are 20 years old, and some were written just a month or two ago. 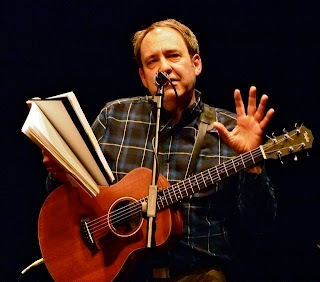 There is a core of stuff but it varies – there’s usually a new poem every few weeks. There’s enough stuff for two hours, easily, but I think an hour and three drams is about enough for most folk. 3 Whisky and the arts – literature and song, anyway – seem to be fairly natural bedfellows. Is it the spirit itself or the many myths and rituals around it that prove most inspirational for you and the show? Tom: I think one constant theme in the show is how whisky represents Scotland, warts and all, good and bad, merry and maudlin. I do think there’s a real magic in the making and even the naming of whisky. Even calling a dram a "wee goldie". It’s conjuring gold from almost nothing but water, barley and flame. 4 I only know of one other whisky show, so does this mean the international stage is wide open to the potential of The Malt And Barley Revue? Tom: I think it’s maybe a wee bit too enigmatic, ambivalent, maybe, otherwise it would be a natural for the whisky after-dinner scene. I’m openly critical of some of the nonsense that’s talked by so-called "brand ambassadors" and there is a lot of rip-off selling going on – ridiculously overpriced malts in obscene, fake packaging. I’ve always had a tendency to bite the hand that feeds...or offers free drink. Tom's thriller came with dram suggestions for each chapter. 5 Your last book, A Whisky In Monsterville, came with its own tasting notes and recommended whiskies per chapter. 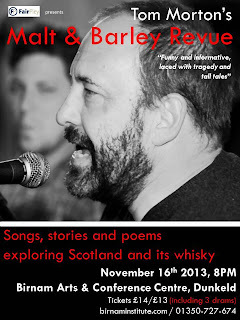 Should we expect a vinyl version of The Malt and Barley Revue with its own cover-mounted dram sachets any time soon? Tom: I looked seriously at offering the book for sale with a miniature of Monsterville malt, but the cost was prohibitive. The next book in the series is called A Whisky Priest, so we’ll see. 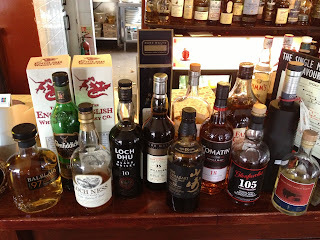 6 Is there any whisky you know of by repute only that you would love/dread to try? 7 If there is some kind of superbeing in the sky, would it think on balance that whisky was a good or a bad thing for mankind? Tom: Whisky comes from the Gaelic uisge Beatha, the water of life. Distillation was invented as a medicinal technique and the early distillers in Europe were all from religious orders. God loves a dram. But in moderation And never if driving. 8 Here’s a desert island dilemma for someone like yourself who loves music and whisky. Your boat is sinking and you can swim to the shore of a particularly attractive-looking, but sadly remote and deserted tropical island ie it will take some time for your loved ones to locate and rescue you. You only have one hand free as you swim ashore, so do you take either: A Music – your favourite record/CD (there will be a player handily abandoned in a safe place with power source on the island) or B Whisky – your favourite tipple in a large bottle? Tom: Fortunately I can sing, and have a reasonable memory for songs. Also, once empty, I could use the whisky bottle to send a message asking for help. Or a jukebox. The Peebles Malt and Barley Revue gig was another chance to visit the rather beautiful town in which I once purchased a breadboard for my wife and was bought a vintage wristwatch in return. It happened like this: Ali Wilson, aka Drumslinger, mastermind and skinbasher behind various eminent east coast bands, was at the launch of A Whisky in Monsterville in Drumnadrochit, and offered to organise an M&BR in his native town. Which he proceeded to do, brilliantly. Thanks to Audrey at the Courthouse, and all the staff there, especially Nicola and whoever made the excellent fish and chips. Also Fay at The Crown, whose breakfasts are deservedly famous. Very nice rooms, too. I do like a high-threadcount-sheet-situation! Great to meet the legendary Evan 'Hard As Nails' Balfour, former Airdrieonian, now singing with the terrific Taylor Brothers. I see you can still buy those 'Hard As Nails' stickers from an Airdrie fan website! Peebles really is a lovely and very friendly place, full of splendid pubs, shops and restaurants, including the truly impressive Villeneuve Wines, run by Alister Rae and Kenny Vannan, with help from Gregg Parker. I liked it so much a bought a bottle of Clynelish 14. It's the only small(ish) town in Scotland with an internationally-acclaimed academy for chocolatiers and pastry chefs, as far as I know. Great crowd at the gig, and thanks too to Ian Rankin for donating a signed bottle of the 'Rebus 20' Highland Park which was auctioned for an eye-watering (but still reasonable, as they're £2500 online) £1500. It will stay in Scotland, and was bought by a Fifer! Next Malt and Barley Revue is at Ayr Gaiety Theatre on Saturday night. We'll be tasting Some highly unusual whiskies including, dare I say it, something from...let's just say outside of Scotland. And my special guest will be whisky valuer and auction specialst, Angus MacRaild from Whisky Online. Two audience video clips from the Rutherglen show are up on on YouTube. Rutherglen sellout and new dates! The Malt and Barley Revue is an hour-long performance of songs, stories and poems by Tom Morton, all about Scotland and whisky. With detours to Ireland and Japan. Funny, informative, laced with tragedy and tall tales, you may find yourself singing about steamboats or along with murderous highwayman, munching a very scratchy sweetmeat or wondering how on earth the Mother of Japanese Whisky came from Kirkintilloch. Belladrum Festival (Verb Garden) 2/3 August 2013. With Jon Beach, and with launch of new book A Whisky in Monsterville.